Please contact us if you come across any mistakes in the content of the book or in the biographies published on this website. 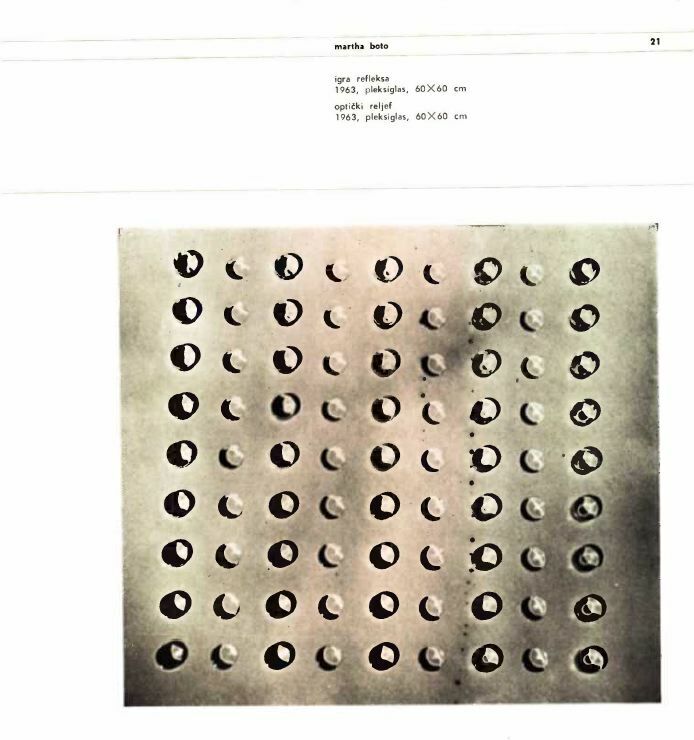 The text "Le Choix dans l’art actuel" by François Morellet was not published in the exhibition catalogue Sigma (1965) as indicated in Mais comment taire mes commentaires (Paris : Ecole Nationale Supérieure des Beaux-Arts, 1999), a collection of texts by Morellet. The text was probably published for the first time 1968 in DATA : Directions in Art, Theory and Aesthetics by Anthony Hill. There, Morellet states 1965 as year of creation of the text. The photograph described with the caption "Martha Boto / Jeu de reflet [Game of Reflection] / 1963 / Plexiglas / 60 × 60 cm" actually shows Relief optique / 1962 / 45 x 45 cm. The title of the exhibition organized by the Czech artist and theorist Jiří Valoch at the Dům umění města Brna [Brno House of Arts] in February 1969 is not Computergraphic but computer graphic. In the list of participants in the Eexhibition nt4 – recentni primjeri vizuelnih istraživanja / nt4 – recent examples of visual research the name Josef Hermann Stiegler is missing. Marc Adrian did not participate at this exhibition. Thanks to Cornelia Cabuk bringing this to our attention. The information about David R. Garrison's date and place of birth was a mistake apparently caused by a copy and paste procedure. The information about his date and place of birth is not available.